➜ 22. "IH" VS "EE"
🎥 Video Lesson 22: "Ih" vs "Ee"
(and get your free 30-minute one-on-one coaching bonus). Hi, I’m Camilla Smith, Trainer & Coach and Founder of Accent Pro® Institute. I understand frustration with sounding fluent because I’ve been learning 4 languages. Sounding fluent is challenging. Since 2007 I’ve helped 1000’s of individuals and Fortune 100 companies, Canada’s Top 100 and National Regional Top Employers. Practical, well researched and useful. There is no comparison on the market for high quality language courses like this one. I used it to improve clarity of speech. I have an heavy french accent. 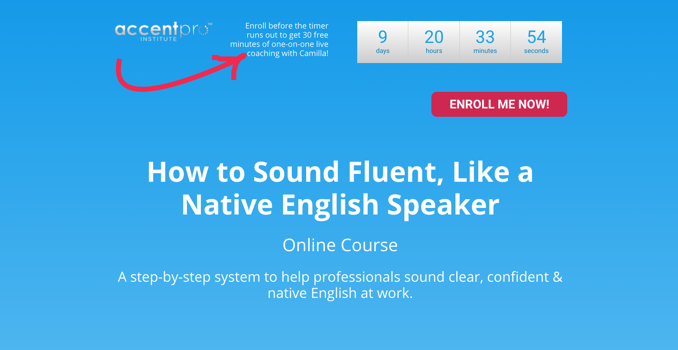 Simon C.
This course is simply the key to all the secrets about sounding fluent and great! Sincerely thanks to this course I improved a lot and I'm still constantly improving too. This course is great because in one hand it teaches me how to teach Myself and on the other hand, it explains rules and grammars simply.